More than a year ago, Canonical began betting Ubuntu users would be willing to pay for certain software titles. The company has now taken that belief one step further, expanding the for-purchase section of the Ubuntu Software Center to include ebooks and magazines as well as applications. Will Ubuntu become the new publishing hub of the open source channel? Read on for thoughts. For now, the available titles cater to the Ubuntu community, with user guides and technical literature high on the list. 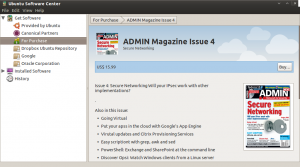 Magazines include Ubuntu User, Linux Magazine, Smart Developer and ADMIN. Through this innovative partnership we are adding eBooks and magazines to the wide range of applications currently available in the Ubuntu Software Center, creating a fantastic revenue opportunity for Ubuntu developers and content creators. Also notable is the promise that the publications will be available as plain PDF files once purchased by users. That’s a relief in a digital publishing market that is becoming increasingly obsessed with wrapping content up in proprietary overhead designed to make sharing and piracy impossible. I wouldn’t put much money on Ubuntu becoming a digital-media consumption platform on the order of the Amazon Kindle or the Apple iPad anytime soon. All the same, Canonical’s partnership with these publishers could become a big deal within the open source channel, which has so far lacked a major digital distribution point for literature of interest to users of open source software. Exposure via the Ubuntu Software Center gives content providers easy and direct access to readers who tend to be technically inclined and interested in open source software. At the same time, the fact that the digital media will be unencumbered by proprietary nonsense should help ensure receptiveness to the products among Linux users, who as a group tend to be turned off by mechanisms designed to restrict the use and sharing of products. And last but not least, this move is a smart one for Canonical because it helps integrate the Ubuntu platform and community. It allows Ubuntu users to learn more about their operating system without stepping away from their Ubuntu computers, and builds bridges to partners with an interest in Ubuntu who exist outside the software industry. We’ll keep our eyes open for expansions of this initiative to other major publishers with open source content, such as O’Reilly. One cannot be fanatically opposed to anything that is not free.